The massive earthquake on April 25, 2015, and its aftershocks have killed nearly 9,000 people in Nepal. Representatives of Hew Coop Japan visited Nepal from October 14 to 17, 2015, to study damage from the major earthquake and reconstruction efforts. 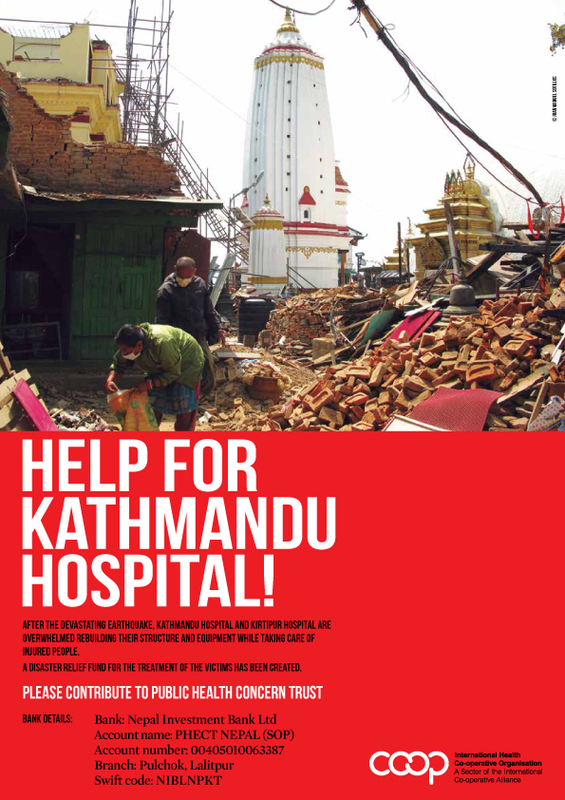 phect-NEPAL, a fellow APHCO member, started medical assistance immediately after the quake. phect-NEPAL themselves were also victims of the disaster. For example, they could not use their hospital ICU because of the quake. However, they continue to provide support to victims; doctors and nurses are playing the leading roles. About a half year has already passed since the quake in Nepal, but the reconstruction process has been slow except in the capital Kathmandu. Disaster victims are still stuck in temporary housing. The temperature will decline as the winter approaches; the life in temporary housing is expected to become even more difficult. After the site visit, Hew Coop Japan President Takaaki Fujiwara met with officers of phect-NEPAL to discuss the damage in Nepal and future support, including financial assistance.